- 1/2 x 1/2 inch. - 3/4 x 1/2 inch. - 1 x 1 inch. With an objective to fulfill the demands of our clients, we are engaged in manufacturing a wide array of UPVC Brass Tee. 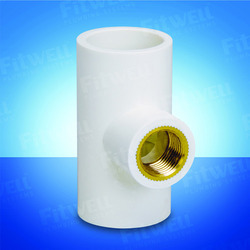 Being a leader in the industry, we are engaged in offering a qualitative range of UPVC Brass Tee to our clients. 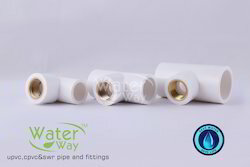 We are one of the trusted companies of UPVC Brass Tee. We are counted as a prominent name in this domain, engaged in offering a wide range of products to our clients. This is extensively used at commercial and household region to hold up pipes for long period of time. As per the demand of our clients, we are offering this product in different size and range.